Watson Falls on the North Umpqua features a 272-foot cascade into the snow. The falls are located off Highway 138. Upper Proxy Falls, located near Mckenzie Pass east of Eugene, can be visited during winter with a long snowshoe or ski trip. Tumalo Falls roars into the snowy canyon below. The falls can be reached in winter via the Road 4603 Trail. Paulina Creek Falls in the snow and ice. Salt Creek Falls in winter of 2011. Jordan Hackworth’s photo of Tamanawas Falls, located on Mount Hood, was named the best picture of the 2012-13 winter season in the Statesman Journal’s Winter Waterfall Hunting photography contest. The picture was taken Jan. 12, 2013. The falls should see some snow with the current storm. Winter waterfall hunting season has arrived in Oregon’s Cascade Range. That means for those who love adventure, it’s time to visit Oregon’s booming waterfalls covered in snow and ice. 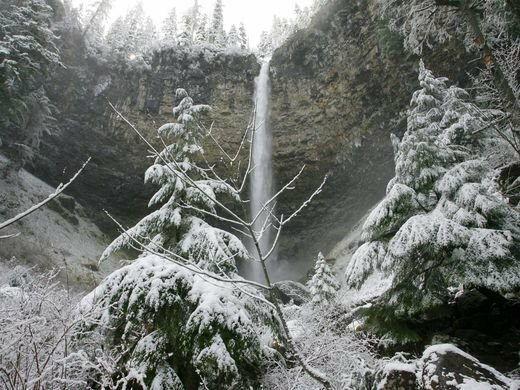 Here are the best hikes or snowshoe trips to Oregon waterfalls covered in snow, including directions. All of the waterfalls featured here can be found off mountain highways that are typically plowed. Even so, take every precaution before making the trip. Check conditions at TripCheck before leaving the house and make sure your car is equipped for winter travel. A snow gate on McKenzie Highway 242 blocks access to this famous pair of waterfalls from November to June, but by bringing snowshoes, skis or waterproof boots, Proxy Falls makes a popular wintertime adventure east of Eugene. After reaching the snow gate on Highway 242, park off to the side and hike, snowshoe or or ski up the scenic highway for 2.5 miles to reach the Proxy Falls Trailhead on the right. The 2-mile loop winds through lava fields and old-growth forest to a view of Upper and Lower Proxy Falls. All told, it’s a journey of 7 miles. Directions (from Eugene): Follow Highway 126 east for 55 miles, past McKenzie Bridge and Blue River, to Highway 242. Drive up to the snow gate and park on the side of the road. The third-tallest waterfall in Oregon drops off sheer basalt cliffs like a thin string of silver rope, plummeting 272 feet into Southern Oregon’s Umpqua National Forest. The winter hike to Watson Falls is probably the most easy and scenic on this list, but with a lower elevation, good snow conditions don’t happen that often. Even so, Watson Falls has easy access off Highway 138 east of Roseburg (or west of Diamond Lake) and only requires a short one-mile loop hike. Even if it’s not covered in snow, it’s still an incredible short winter hike. After hitting Watson Falls, consider Toketee Falls just two miles away, or destinations like Crater and Diamond lakes, Umpqua Hot Springs and many of the beautiful waterfalls off Highway 138. Directions: From I-5 in Roseburg, take exit 124 for the North Umpqua River and OR 138. Follow signs for Diamond Lake through downtown Roseburg and continue east on OR 138 to milepost 61, then turn right (south) onto FR 37. The trailhead parking lot is just down FR 37. A trip to Newberry Caldera and snowy Paulina Creek Falls offers a full-day adventure in winter via skis, snowshoes or a snowmobile. 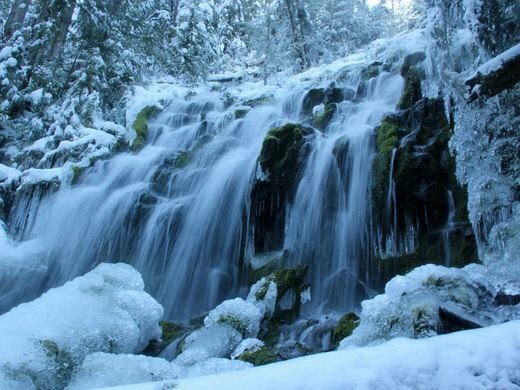 Ten Mile Sno-Park, roughly 35 miles southeast of Bend, is the access point to reach this duo of 80-foot waterfalls. A snowmobile trail leads to the falls following the entrance road. Those on skis or snowshoes can follow a loop trail along both sides of the creek on a 6.8-mile journey. The trip requires a long drive from the Willamette Valley, but the higher elevation also makes for more reliable snow conditions, and there’s plenty to do in nearby Bend. Directions: From Bend, travel south on Highway 97 for roughly 24 miles, then turn left (east) and follow County Road 21 for 10 miles to Ten Mile Sno-Park. This classic trek begins at one of three places off Highway 126, east of McKenzie Bridge. Carmen Reservoir Road is typically the best option for accessing the trails. Wherever you start, snowshoeing is normally best. Follow the Waterfalls Trail and McKenzie River Trail on both sides of the river, using a bridge north of Sahalie Falls and Carmen Reservoir to connect the loop. Directions (from Salem): Follow Highway 22 east, past Detroit, to Santiam Junction. Then follow Highway 20 and 126 south to milepost 5. Signs alert you to the upcoming viewpoint/trailhead. If the snow is too deep, you can also begin the hike on Carmen Reservoir Road. A beautiful hike in any season along Cold Springs Creek, though old-growth forest and over wooden footbridges, leads to this 100-foot waterfall. In winter snow, the trek is nothing short of spectacular. The hike is 4 miles round-trip, which is nice because it gets you out and away from the highway noise, and the waterfall payoff is stunning. Follow East Fork Trail for half a mile, then be on the lookout for a junction with Cold Springs Trail, where you turn left and hike another 1.4 miles to the falls. Directions: From Hood River or Government Camp, follow Highway 35 to milepost 72 to a large parking area and trailhead, which usually stays plowed out in winter. In summer, 89-foot Tumalo Falls can be reached with a short drive from Bend and is among the city’s more popular hangouts. By winter, however, the road is covered with snow, and the best way to reach this Central Oregon gem is with a scenic 5- or 7-mile trip on skis. From Skyliners Sno-Park, Road 4603 Trail runs 5 miles out-and-back to the falls. A more challenging (and scenic) option is 7 miles out-and-back on Tumalo Creek Trail. Directions: From Bend, follow Skyliners Road 10 miles west to its end at a yellow gate. There is room for five cars in small parking area and additional parking back down the road. The chance to discover one of Oregon’s tallest waterfalls covered in snow and ice is one of Oregon’s great adventures and best easy snowshoeing trips. The bonus is that once you reach 286-foot Salt Creek Falls, there are more winter waterfalls to be found on a loop that leads deeper into the forest. From Salt Creek Sno-Park off Highway 58 near Willamette Pass — a two-hour drive from Salem — the easy trail follows a summer access road 1.4 miles round-trip to Salt Creek Falls overlook. Not enough? From the overlook, the 5-mile Diamond Creek Falls Loop dives into deep and silent forest, crossing snowy bridges and following the creek past Diamond Creek Falls and back. Directions: From I-5 in Eugene, take exit 188 onto Highway 58 east. Follow Highway 58 east for 57 miles, past Oakridge. At milepost 57, turn right at a sign for Salt Creek Falls/sno park.